A press conference on this topic will be held Tuesday, March 24, at 3:30 p.m. Mountain time in the Colorado Convention Center. Reporters may check-in at Room 104 in person, or watch live on YouTube http://bit.ly/ACSLiveDenver. To ask questions, sign in with a Google account. DENVER, March 23, 2015 — Saccharin, the artificial sweetener that is the main ingredient in Sweet ‘N Low®, Sweet Twin® and Necta®, could do far more than just keep our waistlines trim. According to new research, this popular sugar substitute could potentially lead to the development of drugs capable of combating aggressive, difficult-to-treat cancers with fewer side effects. The finding will be presented today at the 249th National Meeting & Exposition of the American Chemical Society (ACS), the world’s largest scientific society. The meeting features nearly 11,000 reports on new advances in science and other topics. It is being held here through Thursday. The new work examines how saccharin binds to and deactivates carbonic anhydrase IX, a protein found in some very aggressive cancers. It is one of many driving factors in the growth and spread of such cancers in the breast, lung, liver, kidney, pancreas and brain. Carbonic anhydrase IX helps regulate pH in and around cancer cells, allowing tumors to thrive and potentially metastasize to other parts of the body. Because of this finding, the researchers wanted to develop saccharin-based drug candidates that could slow the growth of these cancers and potentially make them less resistant to chemo or radiation therapies. Except for in the gastrointestinal tract, carbonic anhydrase IX is normally not found in healthy human cells. According to McKenna, this makes it a prime target for anti-cancer drugs that would cause little or no side effects to healthy tissue surrounding the tumor. Carbonic anhydrase IX is similar to other carbonic anhydrase proteins that our bodies need to work properly. So far, finding a substance that blocks carbonic anhydrase IX without affecting the other ones has been elusive. And that’s where saccharin — ironically, once considered a possible carcinogen— comes in. In earlier work, scientists from a group led by Claudiu T. Supuran, Ph.D., at the University of Florence, Italy, discovered that saccharin inhibits the actions of carbonic anhydrase IX, but not the 14 other carbonic anhydrase proteins that are vital to our survival. Building on this finding, a team led by Sally-Ann Poulsen, Ph.D., at Griffith University, Australia, created a compound in which a molecule of glucose was chemically linked to saccharin. This small change had big effects. Not only did it reduce the amount of saccharin needed to inhibit carbonic anhydrase IX, the compound was 1,000 times more likely to bind to the enzyme than saccharin. Using X-ray crystallography, McKenna and his students Jenna Driscoll and Brian Mahon have taken this work a step further by determining how saccharin binds to carbonic anhydrase IX, and how it or other saccharin-based compounds might be tweaked to enhance this binding and boost its anti-cancer treatment potential. The researchers acknowledge funding by the National Institutes of Health, the European Union and the Australian Research Council. The manufacturers of Sweet ‘N Low® state that they did not fund this research. 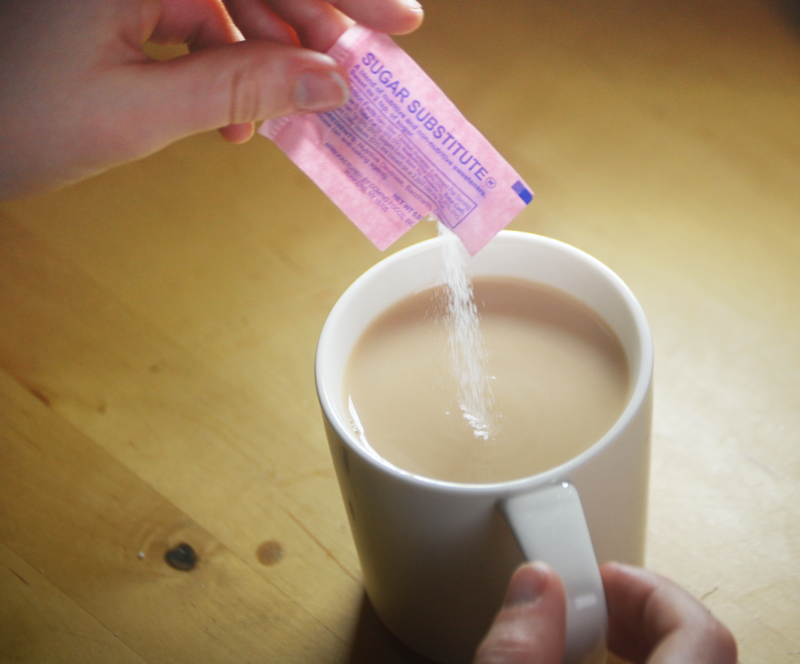 A form of saccharin, an artificial sweetener, could lead to the development of drugs that battle aggressive cancers.